Geometric measure theory has become increasingly essential to geometry as well as numerous and varied physical applications. The third edition of this leading text/reference introduces the theory, the framework for the study of crystal growth, clusters of soap bubbles, and similar structures involving minimization of energy. Over the past thirty years, this theory has contributed to major advances in geometry and analysis including, for example, the original proof of the positive mass conjecture in cosmology. 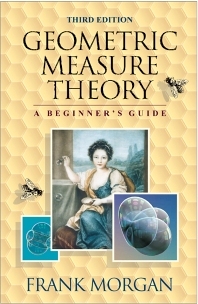 This third edition of Geometric Measure Theory: A Beginner's Guide presents, for the first time in print, the proofs of the double bubble and the hexagonal honeycomb conjectures. Four new chapters lead the reader through treatments of the Weaire-Phelan counterexample of Kelvin's conjecture, Almgren's optimal isoperimetric inequality, and immiscible fluids and crystals. The abundant illustrations, examples, exercises, and solutions in this book will enhance its reputation as the most accessible introduction to the subject. Advanced graduate students and researchers in mathematics. Preface. Geometric Measure Theory. Measures. Lipschitz Functions and Rectifiable Sets. Normal and Rectifiable Currents. The Compactness Theorem and the Existence of Area-Minimizing Surfaces. Examples of Area-Minimizing Surfaces. The Approximation Theorem. Survey of Regularity Results. Monotonicity and Oriented Tangent Cones. The Regularity of Area-Minimizing Hypersurfaces. Flat Chains Modulo v, Varifolds, and (M, E, )-Minimal Sets. Miscellaneous Useful Results. Soap Bubble Clusters. Proof of Double Bubble Conjecture. The Hexagonal Honeycomb and Kelvin Conjectures. Immiscible Fluids and Crystals. Isoperimetric Theorems in General Codimension. Solutions to Exercises. Bibliography. Index of Symbols. Name Index. Subject Index.